Welcome to this amazing collection of 100 fantastic large print sudoku puzzles. This book contains 100 large print grids, which are all 9 x 9 in size. All you have to do is to place each number from 1 through to 9 exactly once in each of the nine horizontal rows and the nine vertical columns that compose each grid. How tough are the puzzles in this book? 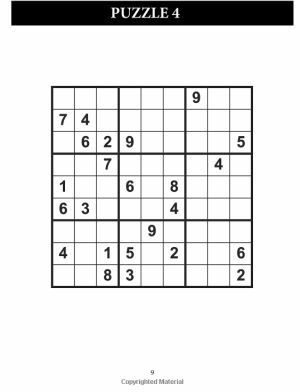 The puzzles in the two volumes of large print sudoku are designed to offer enough challenge that they are fun to solve, without requiring any masterly or incredibly difficult strategies to solve. As such, whilst it varies from puzzle to puzzle, they are approximately at the medium difficulty level that you'd associate with a newspaper puzzle. Thus they should be solvable by anyone who enjoys sudoku and is familiar with the standard solving rules. The numbers are printed large and bold on clear white paper, so there is good contrast. The best way to see if you will be able to play the puzzles OK is to open the sample PDF page above, that shows three puzzles. Set your PDF viewer to 100% to view the exact size of the puzzles in the book, or use your printer (but be sure to set it to 100% so it doesn't scale it to fit to page which would change the size of the print). That's not a problem. We have created a series of sudoku books with even larger print than appears in this book. 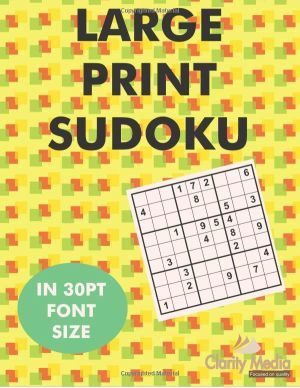 So if you find the large print sudoku just about readable, but still not as clear as you would like, then please take a look at our giant print sudoku books - these contain even larger text.